Retired Royal Doulton (all made in England) your choice $50.00 CAD. After hundreds of years of production in England, Royal Doulton has moved all production to the far east mostly Thailand. When this monumental transition took place a couple of years ago we decided to no longer carry the line. The tradition was lost and we felt the brands direction had changed. In making this change all the English made production became instantly retired and instantly collectible. We are down to our last dozen or so and they’re going fast. All of the in stock figurines are priced at just $50.00 each. Regularly priced at up to $300.00. All are discontinued and no longer available. 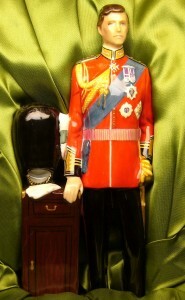 Prince Charles and Princess Diana figurines are not included in this sale. Dumbo RARE RARE RARE $1750.00 CAD. I often over look the giftware and collectables we have in the store. 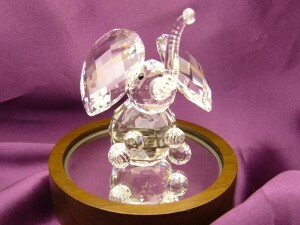 As an authorized Swarovski dealer we have hundreds of rare and retired crystal figurines. This is possibly the most rare in stock. I have very little information on this little guy. He was only available for 1 year in 1988 and only available at Disney theme parks at the Arribas store. The original price was $95.00. Warner’s Blue Ribbon Book circa 2001 has placed a value of $3700.00 on this, not including the wooden mirrored stand that I understand is impossible to find. 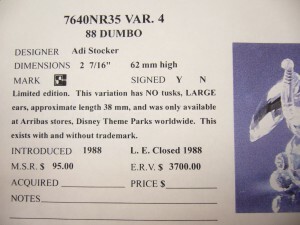 Have a look on the internet just to see how rare this Dumbo figurine is. Search reference number 7640NR34 VAR. 4. Our estate price is $1750.00. Stock #e3432. Royal Doulton Princess Diana and Prince Charles HN2887 HN2883 $1200.00 CAD. It’s hard to believe that almost 33 years have past since the royal wedding of Diana and Prince Charles. 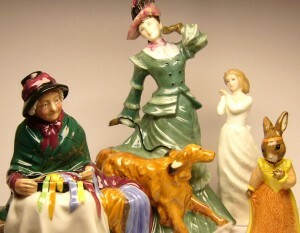 These two hand made, hand painted limited edition Royal Doulton figurines are both in perfect condition. They come complete with special padded boxes, limited edition certificate and wooden display stands. I’m not sure if they have ever even been displayed before. Model numbers HN2887 and HN2884 are limited to 1500 pieces worldwide. Needless to say they are both exceptional examples of Royal Doulton bone china when it was still being manufactured in exclusively England. The delicate hand applied flowers on Diana’s dress are all complete and intact, the detail on Prince Charles uniform is also quite intricate. They are priced as a set only for $1200.00 CAD. Stock #e8192 and e8193. Swarovski make some of the most beautiful crystal figurines, in fact when it comes to their patented crystal manufacturing processes they have no equals. The artists at Swarovski do a great job capturing the character and personality of all the subjects in their creations. This Macaw parrot stands over 9 inches perched on its wooden stand. 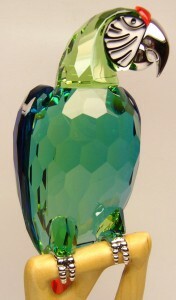 Bright and vivid green, blue and orange sections of faceted crystal make up the body with rhodium plated beak and feet. Item 685824 had a suggested retail price of $1000.00 several years ago before it was retired from the line. This item was received as a gift but never placed on display, it sat in the original foam lined box for years. Original inner and outer Swarovski boxes are included for the estate price of $650.00. Excellent shape in brand new condition. It has never been handled with out gloves, there is not even a finger print on it. For the right home this would make a great centre piece decoration. Stock #e8272. 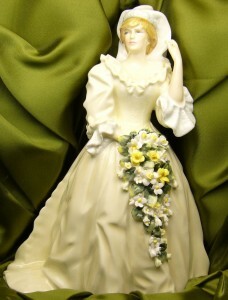 We have a very limited number of Lladro retired and estate figurines available. The female attorney figurine stands approximately 14 inches tall showing a confident expression with her papers and briefcase in hand. She would make a great gift for the lady litigator you know. Lladro figurines are hand crafted in Spain from porcelain. Their artists have an amazing ability to capture unique subtle details of shadow and shading giving each subject a personality. Unlike a 2 dimensional image when a Lladro figurine is viewed a new detail is discovered from every angle. They are truly works of art. Style 6425 was retired several years ago and is a popular model on the secondary market with asking prices from $350.00 and up. This retired lawyer figurine is priced at $242.50 including the original box and packaging. I’m not sure if it was my interest in cars, precious metals or all things shiny that made me decide to obtain this item. I didn’t even know these existed. In 1975 the Franklin mint offered this 100 piece collection of a century of automobiles starting with an 1875 Marcus and ending with a 1975 Volkswagen Rabbit. All the classic makes are represented Ferrari, Porsche, Mercedes Benz, Ford, Chevrolet etc. All cast in a sterling silver ingot with a frosted finish on front and the makers logo on back. Each sterling silver ingot weighs over 1.5 grams. 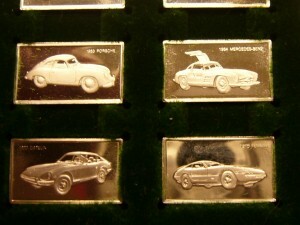 There is just over 5 ounces of sterling silver in the entire collection. The original wooden box with glass display cover is in perfect condition. The box is lined with green velvet that the individual ingots sit securely. Estate price $250.00. 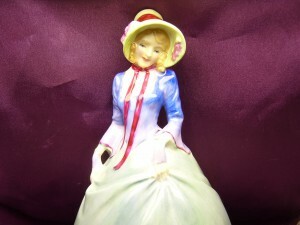 This is currently the oldest Royal Doulton figurine we have in stock. She was issued sometime between 1929 and 1942. The reference number is HN1362. This sassy little ladies name is Panalettes. The Charlton Standard Catalogue places her value in the year 2000 at approximately $700.00. We did a little inter net searching and our estate price of $300.00 is the best out there. Needless to say she is in perfect condition with out a scratch or chip to be found.